Members of both Chambers of the Parliament, representatives of the Ministry of Defence and surviving WW2 resistance fighters remembered the heroic death of Staff Captain Václav Morávek, one of the Three Kings, resistance fighters, killed in a gunfight with Gestapo on 21st March 1942. Among the most important actions carried out by the groups there were two bomb attacks in Berlin. Against the Ministry of Air Travel and police headquarters in January 1941, and in the Berlin-Anhalt rail station in February which failed to kill the leader of the SS Heinrich Himmler because of delay of his train. On 23rd March the Minister of Foreign Affairs Tomáš Petříček (ČSSD) welcomed the final seizure of the last Islamic State’s enclave in Baghuz, Syria. The Minister said that it did not mean the end of the fight against the international terrorism, and that the Czech Republic was ready to support its allies to definitively end the conflict in Syria by any means available. Among the 28 EU countries the Czech Republic is the only one which operates its embassy in Damascus, which thus represents also the EU’s and US interests in the country. On 27th March Minister Petříček, following the announcement of Donald Trump Administration on Golan Heights acknowledged annexation, said the Czech Republic still considers the Goland Heights to be occupied territory, in accordance with the EU position and UN Security Council resolutions. On the same day the Ministry of Defence revealed new details for the tracked Infantry Fighting Vehicles acquisition. There will be 210 new vehicles at an estimated cost of CZK 53 billion (USD 2.3 billion). The vehicles will be required to carry 11 soldiers (crew of 3, 2 specialists, 6 troopers), the 30mm cannons also stands confirmed, and it has been decided the vehicles are to be mounted with manned turrets. Four manufacturers were invited to submit bids to supply the vehicles: BAE Systems (CV9030CZ), General Dynamics European Land Systems (ASCOD 2), PSM (PUMA) and Rheinmetall Landsysteme (LYNX). An important part of production and servicing is to be assured in conjunction with the VOP CZ – a state owned company that specializes in military equipment engineering, production and development. 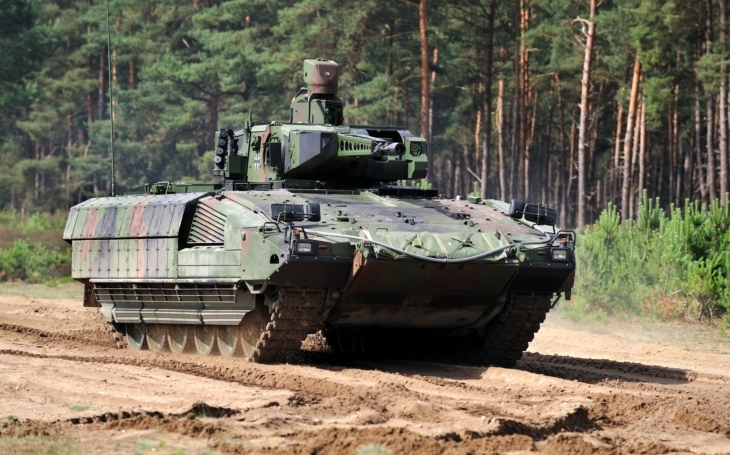 See also: Czech Army’s Modernization Projects: the IFVs; Czech Infantry Fighting Vehicle Tender – manned or unmanned turrets? On 28th March a man and a woman suspected of terrorism in Germany were arrested in Prague. Both are reportedly associated with an Iraqi arrested in Vienna earlier that week. The group is suspected to try to carry out failed terrorist attacks on high-speed trains in Germany in October and December 2018. According to the Austrian Ministry of Interior they have links to the Islamic State. It has been decided on Friday that both arrested citizens of Iraq would be extradicted to Austrian within 10 days.